Sergey Kovrigo was born in ST. PETERSBURG (RUSSIA) in 1961. In 1986 graduated from the Mikhina Higher Industrial Design School in n St. Petersburg. He specialized in restoration of antique paintings. Renowned collectors have acquired his work all over EUROPE. From 1989 exhibited in National Art Museum and private collections of the Russia, Germany, Slovak, Greece, Czech, Poland and Italy. Works in easel painting, monumental, decorative and applied arts. 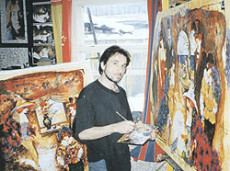 He uses mixed technique masterfully, combining oil, goash and collage thus creating colorful rich texture. Also, he has one more peculiarity: It is not characteristic for him to cipher his works, creating pseudointellectual difficulties for the On-looker, but on the contrary, his paintings are open for everybody who is able to see, and besides, they are not obtrusive. When you sink into the world of this painter’s pictures your feeling of loneliness and separation imperceptibly dissolves in fail pictures, warmed the breathing of the painter.